Added on April 28, 2015 by Nabila Amarsy. Color-coding is a powerful way to add a new dimension of information to your Business Model Canvas. This technique is useful if you’re trying to display the connections within your business model; hoping to contrast current and future business models; or assessing what is uncertain about your business model and what has been validated in the field. Check out three ways color-coding can help improve the way you communicate, design, and understand your business model. Color-coding simply starts by applying some data to specific colors when placing information throughout your Canvas. Application: Emphasize the inner-workings of your business model by building a color-code based on one of the building blocks. Apply it to all the elements that relate to it in the Canvas (e.g. a color applied to different types of customer segments and elements connected to them). The visual image you get reveals the underlying dynamics of your Canvas: in the illustration below we show some of the dynamics of Google's bare-bones business model. In the color-coded version you can immediately see which building blocks relate to users/searchers, which building blocks relate to advertisers and which ones to both. The color-coded version more clearly reveals the platform aspect of Google's business model with relies on two very different customer segments. You can base your color-code on any building block to highlight your own business model dynamics. Tip: if two colors apply to the same element, write it on two sticky notes of different colors and overlap them! Application: Use colors to define specific points in time as another way to reveal more information about your Business Model Canvas. Business models aren’t static - they constantly evolve to protect your company from competitors and adapt to changing environment like new technologies, regulations, or changing customer needs. Use color-coding to draw attention on what must be built (or eliminated) to achieve your strategic goals. Apply a color to elements that exist in your business model today and one to those that you intend to add to your future business model. We know of several companies that apply this simple technique in their strategic planning process to visualize how they intend to improve their business model. Application: When you design a business model, you assume that it will work because you believe that some of its underlying hypotheses are true (e.g. customers care about the problem you’re trying to solve). However, you can’t take the risk of launching your business without priorly testing in the field whether you are right or wrong. With color-coding, you can track which piece of your Business Model Canvas has been validated or invalidated through your experiments on the market, and which assumptions still remain to be tested. 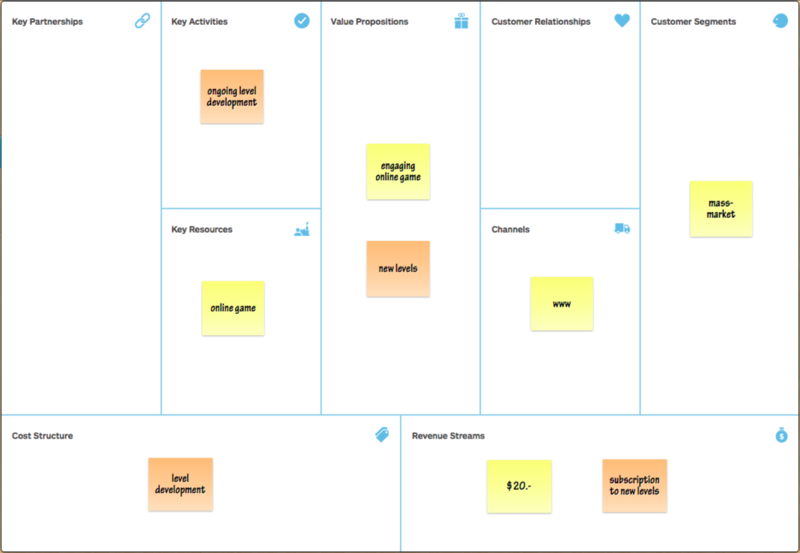 Have you ever applied color-coding to your Business Model Canvas? Tell us about it.